Proudly display who you're walking for in this Personalized Breast Cancer T-shirt. Your unending support and commitment helps fight against breast cancer. Our Breast Cancer Shirt for Walking Awareness Events is available on our premium white 100% cotton T-Shirt, machine washable in adult sizes S-3XL. Also available on Pink. Includes FREE Personalization! Personalized your Walking T-shirt with any title and name. Check below for quantity discounts. 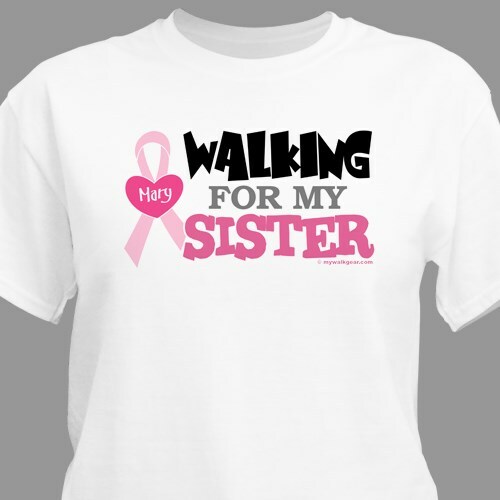 MyWalkGear.com has many additional Personalized Breast Cancer Walk Shirts for your special gift giving needs. Each time a gift is purchased from our Breast Cancer Awareness line of personalized gifts, MyWalkGear.com will make a donation of 15% of the purchase price to help in the fight against breast cancer.